Tracy Cooks in Austin: Well, it's NOT food but it's about me and stuff I made that has been published in a magazine, so take a look! Well, it's NOT food but it's about me and stuff I made that has been published in a magazine, so take a look! I made a bunch of geometric art quilts because Connor was in England and I had uninterrupted time. He doesn't take up any actual time any more, he's 18 now, but he takes up mental time and when I'm in mom mode, I don't art very well. He was away for a month and I spent time in the studio (the dining room in my house, one day I'll have a REAL studio but I digress.....) I spent free mental time in the studio but I also needed instant gratification. I could not face cutting fabric into itty bitty teensie tiny pieces of pieces purely to sew it back together so I played with shape and form and made the whole cloth quilts by adding fabric till they told me they were done. Sort of like how I cook isn't it? I spent time sewing and cutting and fusing and playing and lo and behold NOW they're in a magazine with my howto and I am tickled and have to yell it from the rooftops. As I said, I sew and I do art quilts and cut fabric up and then sew it back together, usually while I wait for food to cook. 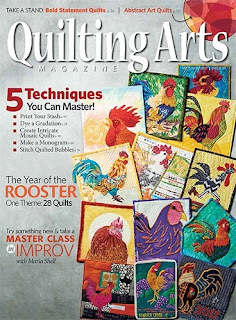 The difference is that THIS month, MY technique for making geometric art quilts is in a magazine. 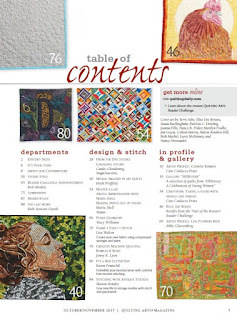 So, this is some of the work I do in the art quilt world. 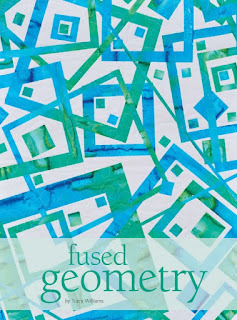 I also do scribble quilting and some artjournal artquilts but today, we're just talking about, and I'm celebrating, my geometric art quilts. Thanks for the time, the read and the great support I get from the foodies and the arties.